• Singapore companies will not have to pay tariffs for exports to Sri Lanka on 80 per cent of product categories for 15 years. • Tariff savings of $10 million yearly for Singapore firms. • Greater market access for professional, environmental, construction, tourism and travel services. • Singapore firms can bid for large government procurement projects. • Liberal rules of origin, so goods from other countries processed in Singapore will enjoy low tariffs. • Safeguards against expropriation of and discrimination against Singapore investments. • Encourages e-commerce, with clauses to facilitate data transfer. • First deal to list Singapore International Arbitration Centre as an avenue for disputes to be raised - a boost to Singapore's status as arbitration hub. Large and smaller Singapore companies looking to invest in Sri Lanka will benefit from the new free trade agreement, Prime Minister Lee Hsien Loong said yesterday. "Many investments are planned," he noted, citing established players like flour producer Prima Group, which entered Sri Lanka in 1977, as well as newer ones like infrastructure firms Hyflux and Sembcorp. Even smaller firms like food court chain Food Republic are coming to Sri Lanka, he said in an interview with Singapore media. "These are all positive results from the FTA." The newly signed FTA was welcomed yesterday by companies and observers, who said it was a comprehensive, high-quality deal. MP Liang Eng Hwa, who chairs the Government Parliamentary Committee for Finance and Trade and Industry, said it provides "tangible help" for Singapore businesses. Mr Ivan Yeo, who runs a Colombo seafood restaurant, Cajun on Wheels, expects the deal to translate into lower costs when importing supplies and raw ingredients into Sri Lanka. Sri Lanka would also benefit from Singapore investments, said DBS economist Irvin Seah, because there would be "procurement locally, hiring locally... and a transfer of technology and best practices". The FTA comes at a time when trade with Sri Lanka is growing. Bilateral trade hit $2.7 billion last year, up 27 per cent from 2016. Singapore is also Sri Lanka's seventh-largest foreign investor. The FTA was signed after 18 months of negotiations. A 2004 attempt to reach an agreement failed. Asked what had changed since 2004, Mr Lee said the current Sri Lankan government is on a path of economic liberalisation and wants more trade and investments. It has been negotiating FTAs with a few partners, but Singapore was the first to sign one, he noted. "Firstly, our trade with them is not so complicated. Secondly, they hope to set an example for their other trading partners," he said. Mr Lee paid tribute to trade officials on both sides, but singled out the chief negotiator for Sri Lanka Saman Kelegama, who worked hard on the pact but died last year before it was sealed. "We owe something to him," said Mr Lee. In the lead-up to the FTA signing, some Sri Lankan businesses and professional groups expressed opposition to the deal. To address the concerns, the government said it would look at new laws to counter sudden surges in imports and perceived unfair trade practices. Asked if Sri Lanka may use these laws to go around some FTA terms in the future, Mr Lee said that any deal signed is considered a binding international agreement, and there are channels to settle disputes over differences in interpretation. On the protectionist backlash, he said there will always be pressures to preserve the status quo in any country. There will be winners and those adversely affected when a market is opened up to competition, he added. "The people who are adversely affected are... more concentrated and more effective at making some noise." He said Singapore relied on the Sri Lankan government to persuade its population that the FTA is a good thing. As for Singapore's broader strategy on trade deals, Mr Lee said: "We are not just trying to get as many deals as possible, otherwise we will collect up lots of little stamps." The preference was for all countries to come together for a World Trade Organisation deal, he said, but this is difficult, given that "political winds are against it". Hence, Singapore looks to do bilateral and regional FTAs. Before pursuing a deal, Singapore asks if its businesses will benefit, how difficult it is to reach a deal and whether that deal is needed to ensure the country has "enough of a safety net" if the global free trade framework falls apart. Bilateral and regional FTAs are more untidy, he noted, "but we have to live with this untidiness". COLOMBO • Just before the sixth round of talks for a free trade agreement (FTA) with Singapore, Sri Lanka's chief negotiator - a staunch free trade advocate - died of a heart attack. Dr Saman Kelegama's death last June cast a cloud of uncertainty over the future of the negotiations. Would the new chief negotiator believe in the deal the way Dr Kelegama did? Would the talks face a long postponement? Dr Kelegama was highly respected by his team, Singapore's chief negotiator Luke Goh said in an e-mail interview with The Straits Times yesterday, a day after the FTA was signed in Colombo. Besides the strong mutual respect between the two chief negotiators, they were also "remarkably aligned in their world views on the benefits of free trade", Mr Goh said. His anxiety, however, was swiftly assuaged by the Sri Lankans when they next met last August. Though shocked and saddened, they "regrouped rapidly", with the deputy chief negotiator taking over and resuming talks with "hardly any delay". It will also enhance investment protection and ensure Singapore companies can bid for government procurement deals. Mr Goh, who is also deputy secretary for trade at the Ministry of Trade and Industry (MTI), led a team of 25 negotiators from nine government agencies for the talks. His core teammates were deputy chief negotiator Francis Chong and team members Kashnan Dara, Amanda Kwek and Gillian Goh. A key factor in their success is an understanding of the other side's "underlying needs and constraints", and coming up with the terms to meet those needs, he said. The complexity of trade procedures and market access rules "give tremendous leeway for creative solutions", he added. Sometimes, site visits were useful. The Sri Lankans were invited to visit re-manufacturing centres in Singapore to help them understand that they churned out high-tech products and not simply used cars, said the team. On tariffs, some Sri Lankan lobbyists felt Singapore had "nothing to give" as it had few tariffs to eliminate. This meant the team had to work harder to persuade Sri Lanka that Singapore imports and investments would benefit Sri Lanka. Singapore also made the strategic choice of focusing on product categories "with the greatest potential to enhance bilateral trade", instead of trying to eliminate all tariffs. But one tariff the team failed to get rid of was that for petroleum products - an important export item for Singapore. The team told The Straits Times that petroleum was particularly sensitive for Sri Lanka because there were already certain investments being planned based on existing tariffs. Changing tariff levels would jeopardise those investments. They decided to close the deal without petroleum, as "a perfect agreement that misses the moment could well be perfectly useless". Back in Singapore, the team talked to firms to find out what mattered most to them. Tariffs, local taxes, Customs procedures and clearing times can all impact a company's profits, but each company may value each benefit differently. To better understand negotiating, Mr Goh stood on the shoulders of predecessors, relying on handbooks written by past negotiators. He said: "There is a famous anecdote of two parties failing to reach a deal on dividing an orange because they failed to realise that one wanted it for juice, while the other desired the peel for marmalade. "It could have been a win-win had they taken the time to understand each other better," he said - a mistake Singapore and Sri Lanka were wise to avoid. Despite growing anti-trade rhetoric around the world, there remain countries that wish to cut trade deals and advance economic integration as they see the benefits in them, said Minister for Trade and Industry (Industry) S. Iswaran. This is evident from the trade deal reached on Tuesday by the 11 remaining nations of the Trans-Pacific Partnership (TPP), he noted yesterday. The new TPP-11 deal was reached a year after the United States pulled out, amid a protectionist tide that swept many nations. Mr Iswaran called the TPP-11 agreement a welcome development. The deal still has some way to go because it must be ratified by each of the 11 countries, he said, but "there is reason for optimism". Mr Iswaran was speaking to the Singapore media in Colombo a day after the signing of Singapore's new free trade agreement (FTA) with Sri Lanka. The FTA is significant, and marks a new milestone in relations between the two countries, he said. It helps both countries reach regional markets. For Sri Lanka, this means accessing the ASEAN market through Singapore, and for Singapore, accessing South Asia through Sri Lanka, he added. The FTA guarantees zero tariffs for 80 per cent of product categories among Singapore exports to Sri Lanka. Tariff savings are estimated at $10 million yearly. The deal also opens up to Singapore firms Sri Lanka's services market and government procurement projects, and ensures better protection for Singapore investments. Prime Minister Lee Hsien Loong, who was in Sri Lanka to witness the FTA signing, concluded his official visit yesterday. Before leaving, he received a courtesy call from leader of the opposition R. Sampanthan, during which he reiterated Singapore's support for Sri Lanka's development and national reconciliation process. Mr Lee later flew to New Delhi to begin a visit to India, where he will attend the ASEAN-India Commemorative Summit. The FTA raised some concern among Sri Lankan businesses, which felt the trade-offs made by their government in opening up markets were considerable. Asked what trade-offs Singapore had to make, Mr Iswaran said: "I can't really go into specifics, because there is no direct one-for-one trade-off. You have to look at the trade agreement as a package." He added: "On the whole, trade-offs - yes - but in terms of our commitment, they have not exceeded what we have, in general, committed to in other agreements." Mr Lee and Mr Iswaran also met representatives of Singapore and Sri Lanka businesses yesterday. At the business forum, three Singapore firms signed deals to expand their presence in Sri Lanka. Food Studio, which owns a prawn farm, will set up and operate food courts in several malls. Aquaculture firm Ark Holdings will build and run a crab farm, while HPL Hotels and Resorts entered into a deal with Bank of Ceylon to redevelop and operate an iconic colonial property. Free trade made a strong comeback on the global scene this week. The 11 countries that remain in the Trans-Pacific Partnership announced that a deal had been reached, one year after the United States unceremoniously pulled out. 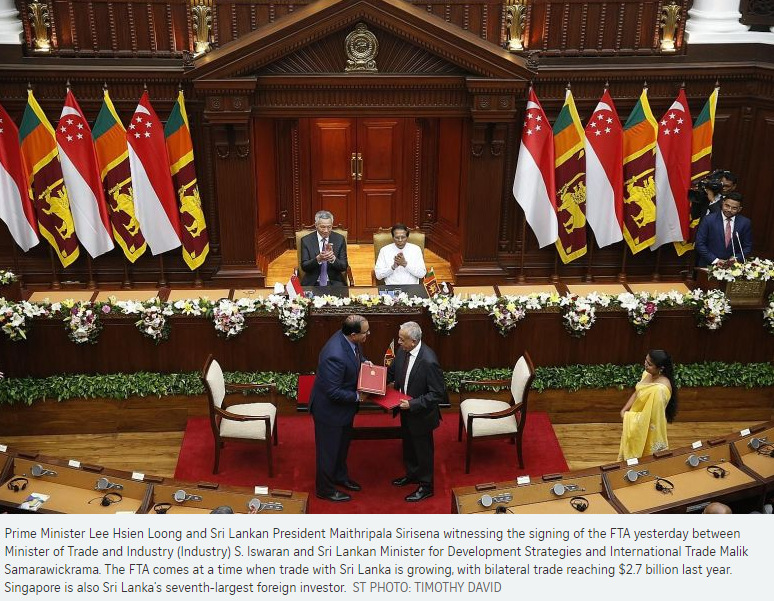 On the same day - by coincidence, not design - Singapore signed a free trade agreement with Sri Lanka, witnessed by Prime Minister Lee Hsien Loong, who was in Colombo on an official visit, and his host President Maithripala Sirisena. With these developments, some balance is being restored to the once-dominant narrative that with Brexit and the election of US President Donald Trump, the voices of anti-globalisation were in the ascendancy. But also in the news yesterday were new, prohibitive tariffs unveiled by the US on solar panels and washing machines, which prompted official complaints from South Korea and China. It was a sobering reminder that the Manichean struggle for a freer flow of goods and services is by no means over. If the far right and far left forces of Western democracies make further electoral progress, global divisions on the issue of trade may yet sharpen. For Singapore, these developments throw up many imponderables, and a strategic rethink of the Republic's approach to trade deals may be on the minds of many in the Government. As a small and open economy, heavily reliant on trade and investment flows across national borders, Singapore's national interests are clearly defined. What is less clear is how Singapore should allocate time, energy and other resources to different aspects of the free trade game. Which countries should it sign bilateral deals with? How much attention should it pay to regional FTAs? And what about World Trade Organisation (WTO) deals, which cover all countries, but failed to make headway at the last round in Doha? PM Lee shed some light on the thinking behind such questions this week. After the FTA signing with Sri Lanka, he said Singapore prefers WTO deals, but given that political winds do not favour them, bilateral and multilateral deals have to be done, even if they are messier. That said, Singapore does not go out and do as many deals as possible. That would be like collecting lots of little stamps but having nothing to show for it at the end, he said. Each of these deals is assessed on a case-by-case basis. Nothing unexpected so far - until he pointed out that one criterion in these assessments is whether the prospective deal will enhance Singapore's security and ensure there is "enough of a safety net" if the global free trade framework were to come apart entirely. Apparently, such a doomsday scenario - which may have been harder to contemplate in another era when all the leading developed economies were pro-trade - is now an uncomfortably real possibility that needs to be planned for. For a big country that could get by on self-sufficiency if trade wars break out and countries retreat into their own economies, the threat of the world trade order breaking down is, at worst, frightening. But for Singapore, such an eventuality could trigger an existential crisis - and in extremis, lead to the end of independence and sovereignty as we know it. There is hence a need to put one's eggs in as many different baskets as possible. A bilateral deal between Singapore and any other country, say Sri Lanka, could well survive a battering to global trade as long as the dominant view in both countries continues to sustain it. Still, the current challenges may also belie a unique opportunity for Singapore. If some developed countries - including the one with the biggest economy of all - no longer have an appetite for trade deals, then developing countries that need those deals to escape their low-income traps have fewer partners they can choose from to do deals with. This matters. While in theory, a country can talk to as many countries as it wants to, in reality, they have limited resources. There are only so many trade officials through whom the talking can be done, and only so much mindshare that political leaders have to start exploring yet another prospective pact. Hence, what appears to be a shrinking space for trade deals globally could in fact be the chance for Singapore to move up the priority lists of its trading partners and seal those deals while it can. It seems a strange situation for Singapore to find itself in. A global chill has come upon free trade, and it may even start to feel like the beginning of a winter. But Singapore must make the proverbial hay while the sun is still out, lest it is caught unawares by the onset of winter - or worse, an ice age.